This Chamaiporn Jaturaput movie page contains 3 records. Thai movie หลวงตา 3 สีกาข้างวัด was released in year 1991. As it is linked to Buddhist religion, the story is sensible as based on a real story (อดีตพระนิกร-สีกาอร). The movie was even censored and cut a few times. Lor Tok is playing Luang Ta again. Waen (Kiet Kijcharouen) and Biu are playing temple boys (เด็กวัด) roles. Veteran actress Chamaiporn Jaturaput is playing a market woman (แม่ค้า). Luang Ta is always helping and listening to his community. He also faces various problems of daily life with its lies (people asking for money to ordain but claiming later that money disappears...). Oratai's elder sister, Phiya, is a nun (แม่ชี). She quit her home as her father was a drunkard. She ended up working in a brothel. Luang Ta visits a buddhist temple with Biu and Oratai. The monk there is having a huge number of followers and claims having been in paradise and hell already. Speech competition (เทศ) happens between the two monks. 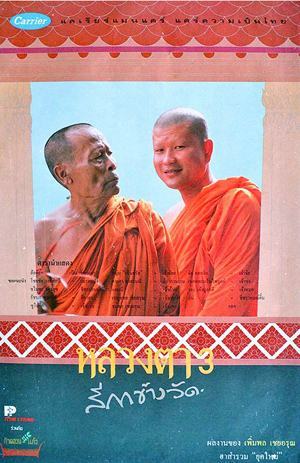 The monk (เณร) proposes to Oratai to be his follower (ลูกศิษย์). Oratai accepts. Later on, the monk is looking for opportunities to be alone with Oratai. Biu and Wen always disturb Phiya as Biu is fond of her. Luang Ta uses a funny stratagem to ensure they stop disturbing Phiya (สงบ). The monk gets massage despite still being young. Phiya, worried about her sister Oratai (สีกา), wishes to get her back (ชาวบ้านนินทา). A monk staying alone with woman is incorrect. It tarnishes Buddhism reputation as religion (เรื่องไม่ดีไม่งาม). Phiya, unable to get back her sister, consults Luang Ta. Luang Ta asks help from a senior monk in the hierarchy. Finally Oratai goes back to her sister. Some followers of this monk are upset about Luang Ta and his friends. They wish to kill them. If the monk is defrocked, then they will lose the good life they get through the money coming from donation! (คนชั่ว). They finally get arrested by the police. Oratai becomes a nun (แม่ชี) also. The movie ends up with compassion message as the market woman educates 4 children that are not hers. Director is Permpol Choei-arun famous for his drama and social movies. Narit and Pat are a happy family with one daughter. They have a trip to Pattaya. There Narit meets Jenjira, a lonely beautiful young girl. Narit is doing commercial advertisements. As looking for a model for sport car advertisement, he meets Jenjira again. She seduces him. He starts to party. He was a good husband but starts to misbehave. Jenjira never had a father and her mother died when she was 12. Jenjira is too possessive and crazy. She hurts herself in order that Narit stays longer and takes care about her. Narit and Pat move to a new home. Jenjira wants to see Narit again but he prefers to break up in order to focus on his family and job. Jenjira is heart broken. She starts to call at his home. She announces that she is pregnant and that she will keep the baby. Jenjira shows up at Narit's apartment, which is for sale, and meets his wife feigning interest as a buyer. She blames Narit for having no responsability same as her father. She puts a snake inside their daughter's bird cage. Narit has to say the truth about Jenjira to Pat. Jenjira kidnaps their daughter O but finally releases her. Pat is hurt by a car. Jenjira starts to be violent and try to kill Narit as she is afraid to lose him to Pat. Through a final confrontation, Pat has to shot Jenjira in self-defense. It is the Thai remake of Fatal Attraction with Michael Douglas and Glenn Close.